your role as a parent in delaying the use of alcohol. Most Montana parents (91%) DISAPPROVE of high school students drinking alcohol. Center for Health and Safety Culture. (2018). 2017 Montana Parent Survey Key Findings Report, Bozeman, MT: Montana State University. 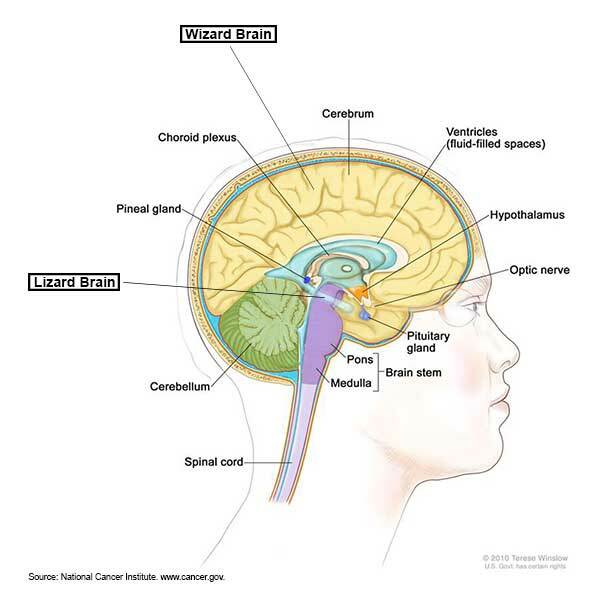 The limbic system is a reactionary system and can be called the lizard brain because it is the most primitive part of the brain and is comparable to the entire brain of a lizard. It is fight or flight, but not a lot of thought. It tells your teen to jump out of the way of a runaway bus when there is little time to think about it. The prefrontal cortex can be called the wizard brain. It is the thinker. When the wizard brain is in charge, your teen will stop and think things through and consider consequences. The lizard brain processes all stimulus received from a situation and communicates with the wizard brain through a relay system. During the teenage years, both the lizard brain and wizard brain go through massive changes and development to create more efficient systems.2 The lizard brain is done with this restructuring around the age of 15, but the wizard brain is not done restructuring and maturing until the mid-twenties. Therefore, in times of stress or social pressure, the teenage brain is dominated by the lizard brain – the need for reward and meeting social needs, and rational decision making, considering consequences – the wizard – takes a back seat.2 This disconnect between the lizard brain and the wizard brain is made worse by alcohol. Alcohol use can disrupt healthy brain development and slow the development of the wizard brain, thereby increasing the likelihood of engaging in risky behaviors. Even though a teen may know about the risk of drinking alcohol, in certain situations, they may still choose to drink. “I just wasn’t thinking” is partially true because of their developing brains.3 Because teens are very “now” oriented, whatever immediate situation a teen is in at that moment has a significant impact on their decision making. As a parent, you have probably already had multiple conversations about the harmful consequences of choosing to drink alcohol or try other drugs. And, you may have ended those conversations feeling confident that your teen understands the risks. However, all the brain matter required to apply their knowledge at the right time may not be there – the wizard may still be sitting in the back seat instead of the driver seat.4 The way to support your teen’s brain is to prepare your teen for high-risk situations that they will encounter by continuing to have frequent conversations about alcohol. Teens need the structure and support of their parents to help prepare their brains to make the right decision when the pressure is high. Alcohol has a greater negative impact on a teenager’s brain than an adult’s brain. This is because during the teenage years, the brain is going through significant structural and functional changes. Neural connections that are used frequently are being strengthened while those that are not used are weakened or discarded. When alcohol is used during this time that the brain is going through a clean-up and pruning process, it affects the developing brain in several different ways. It affects the way neurons communicate with each other. The teenage years are an important time for the developing brain. Alcohol can negatively impact this developmental process. Can Parents Really Make a Difference? stay involved in their life. Unfortunately, despite being such an important influence, parents often underestimate the influence they have on their teen’s decision to drink alcohol. Parents underestimate the difference they can make in guiding their teen’s choices and behaviors. You make a difference. You are the solution. Giedd, J.N., Blumenthal, N.O., Jeffries, et al., (2010). Brain development during childhood and adolescence: A longitudinal MRI study. Nature Neuroscience, 2 no. 10 (1999): 861-3. Strauch, B. (2003). The primal teen: what the new discoveries about the teenage brain tell us about our kids. Anchor Books: New York. Baxter, L., Bylund, C., Imes, R., & Routsong, T. (2009). Parent-child perceptions of parental behavioral control through rule-setting for risky health choices during adolescence. Journal of Family Communications, 9, 251-271. American Medical Association. (2009). Harmful consequences of alcohol use on the brains of children, adolescents, and college students. American Medical Association. Monti, P. M., Miranda Jr, R., Nixon, K., Sher, K. J., Swartzwelder, H. S., Tapert, S. F., … & Crews, F. T. (2005). Adolescence: booze, brains, and behavior. Alcoholism: Clinical and Experimental Research, 29(2), 207-220. Clark, T., Nguyen, A., Belgrave F., & Tademy, R. (2011). Understanding the dimensions of parental influence on alcohol use and alcohol refusal efficacy among African American adolescent. Social Worker Research, 35(3), 147-157. Habib, C., Santoro, J., Kremer, P., Toumbourou, J., Leslie, E., & Williams, J. (2010). The importance of family management, closeness with father and family structure in early adolescent alcohol use. Addiction, 105, 1750 -1758 . Grant, B.F., and Dawson, D.A. (1998). Age at onset of drug use and its association with DSM–IV drug abuse and dependence: Results from the National Longitudinal Alcohol Epidemiologic Survey. Journal of Substance Abuse 10:163–173, PMID: 9854701. The U.S. Department of Education, The Drug Enforcement Administration. (2014). Growing Up Drug Free: A Parent’s Guide to Prevention. Justice.Gov. http://www.justice.gov/dea/pr/multimedia-library/publications/growing-up-drug-free.pdf. Bonnie, R. J., O’Connell, M. E., & Underage Drinking, N. R. C. (US) and I. of M. (US) C. on D. a S. to R. and P. (2004). Consequences of Underage Drinking. National Academies Press (US). Recommended Citation: Center for Health and Safety Culture. (2019). Alcohol and the Teenage Brain. Retrieved from https://www.ParentingMontana.org.